Solar inverters are used in photovoltaic (PV) systems to convert the DC voltage supplied by the solar cells into AC voltage, to adapt it to the voltage level of the power grid and feed it to the grid. 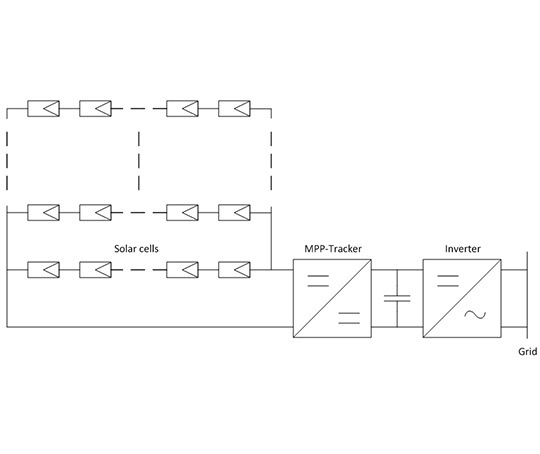 The image below shows the basic structure of a solar inverter without transformer, with the function groups: boost converter/MPP tracker, DC bus voltage and inverter. 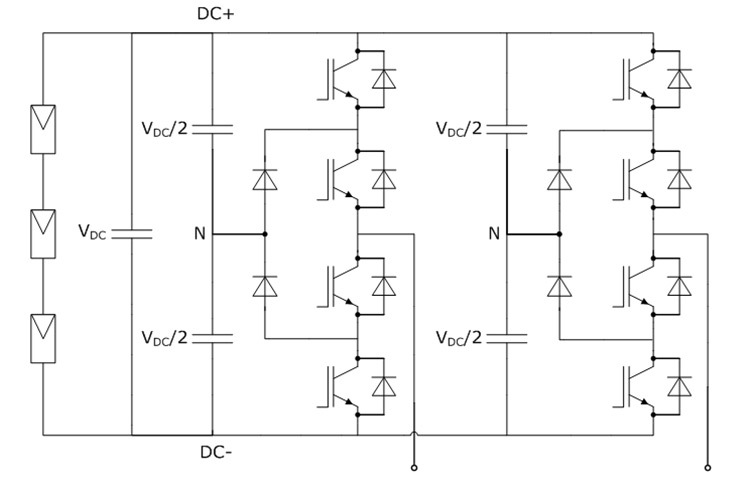 The DC/DC boost converter scales up the output voltage of the solar panel to the level of the DC link voltage. 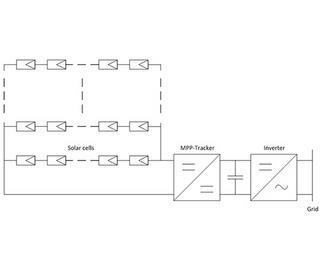 Depending on the incidence of light on the solar cells, the MPP tracker (Maximum Power Point) controls the operating point in such a way that the product of output current and output voltage is the maximum possible (highest efficiency). 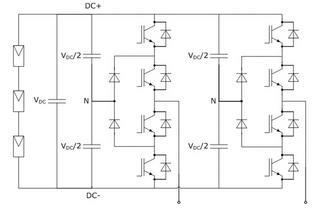 The DC link voltage is converted by an inverter with IGBTs or power MOSFETs into AC voltage, and is then fed, as single- or three-phase, into the low-voltage mains system, or, via a transformer, into the medium-voltage system. 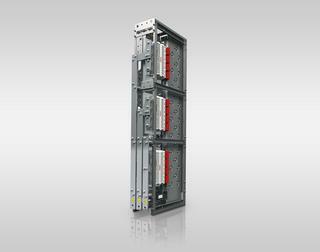 PV systems for island operation with stand-alone inverters are not coupled to the energy grid and work independently or are synchronised with other power generators, such as diesel generators or wind power plants and energy storage units. 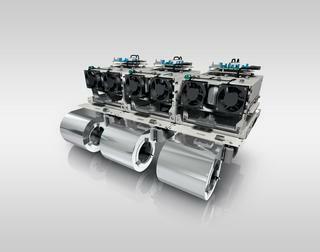 System designs using hybrid inverters are currently gaining in importance. 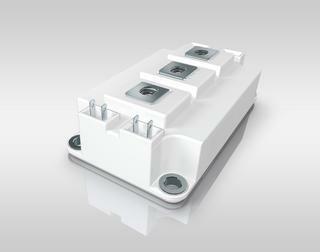 These have battery storage connected to the DC link via a DC/DC converter. This allows for "private consumption", i.e. it is not compulsory for excess energy produced to be recovered by the utility companies, and systems with very high output can also contribute to support the grid. 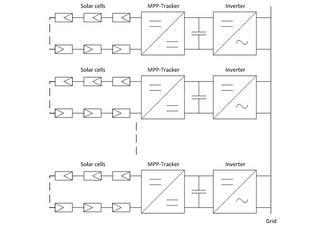 Depending on the solar panel area, output, light conditions and application, solar cells and solar inverters are interconnected differently, resulting in different inverter structures. 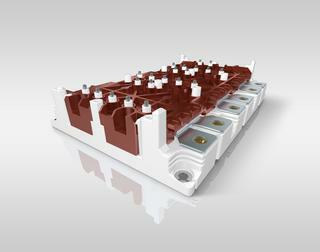 A single-phase inverter with low output is connected to each individual solar module. 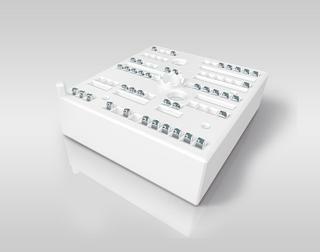 This model is used for sub-arrays with extremely varied orientation and shading, such as on vehicles. 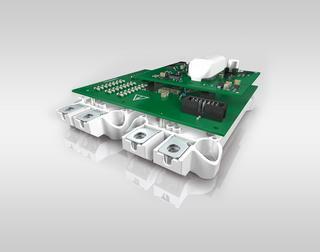 Single-phase inverter with MPP tracker for typical outputs ranging from 0.5 kW to 5 kW for a string of solar panels connected in series. 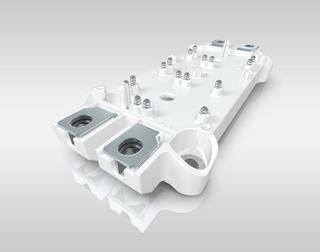 These are widely used in rooftop photovoltaic systems on private dwellings. 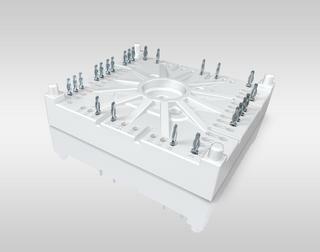 Many different, occasionally specialised topologies are used here. Relatively large three-phase inverter system (switchgear cabinet) with outputs ranging from 60 kW to 1 MW, with several MPP trackers for larger solar farms. 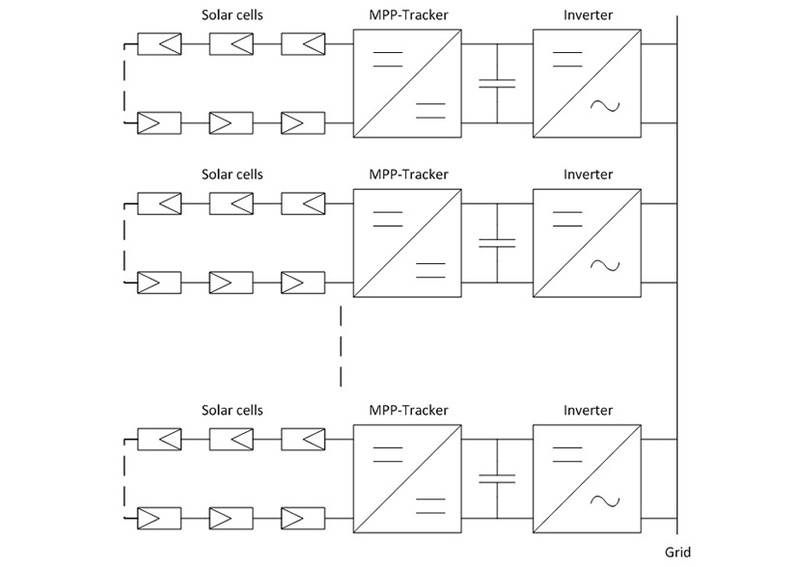 Single- or three-phase inverter with several MPP trackers for multiple strings of interconnected solar panels. 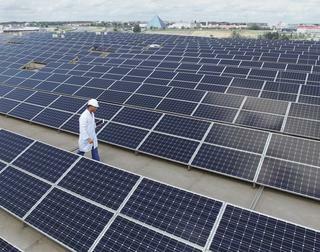 Multistring inverters are used in medium sized rooftop or ground-based systems, for example. 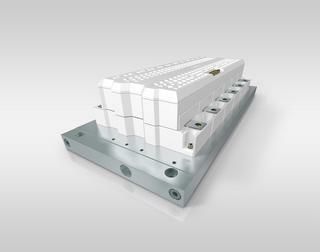 The three-phase inverters are available for typical outputs of between 3 kW and 30 kW.